. Let’s get to know you! and I’m a Type Patient Sibling Offspring Parent Friend AYA Nurse LEAP GP Counsellor CCF Family Worker Leukaemia & Blood Cancer NZ CanTeen Staff Social Worker Cancer Society . Please correctly fill out all input fields. Nice to meet you . Tell us a bit about yourself! Ethnicity Maori NZ European African American Asian Australian British Cambodian Canadian Chinese Cook Island Maori Dalmatian Dutch Fijian Fijian Indian Filipino French German Greek India Indonesian Iraqi Irish Japanese Korean Middle Eastern Niuean Pacific Islander Pakistani Rarotongan Russian Samoan Scottish Somali South African Sri Lankan Taiwanese Thai Tokelauan Tongan Vietnamese Welsh Other Asian Other European Other Pacific Peoples Other decent. Month January February March April May June July August September October November December Year 2017 2016 2015 2014 2013 2012 2011 2010 2009 2008 2007 2006 2005 2004 2003 2002 2001 2000 1999 1998 1997 1996 1995 1994 1993 1992 1991 1990 1989 1988 1987 1986 1985 1984 1983 1982 1981 1980 1979 1978 1977 1976 1975 1974 1973 1972 1971 1970 1969 1968 1967 1966 1965 1964 1963 1962 1961 1960 . CanTeen is for young people who are 13 years old or over. We’d love to have you when you turn 13! For now, we’d recommend you get in touch with The Child Cancer Foundation. CanTeen is for people 13-24 years old. But there are lots of other support options for adults. Where do you live in New Zealand? Region Auckland/Northland Waikato Central Northern South Island Otago/Southland . My nearest CanTeen branch is Branch Northland Auckland Hamilton East Cape Rotorua Tauranga Manawatu Taranaki Hawkes Bay Wellington Nelson/Marlborough Canterbury/West Coast Dunedin Southland . I’m currently Working/Studying Working Studying Other . My NHI number (if you know it) is . Tell us about your diagnosis. I was diagnosed with Type of cancer Acute lymphocytic leukaemia Acute myeloid leukaemia Acute non-lymphocytic leukaemia Adenocarcinoma Adrenocortical carcinoma Aggressive fibromatosis Aplastic Anaemia Astrocytoma Bowel cancer Brain Tumor Burkitts lymphoma Carcinoma of breast Carcinoma of gastro-intestinal tract Carcinoma of genitourinary tract Carcinoma of trachea, bronchus and lung Carcinoma of myeloid leukaemia Ependymoma Ewings Sarcoma Fibromatous neoplasms Fibrosarcoma, neurofibresarcoma or other fibromatous Germ cell & trophoblastic neoplasm of gonads Germ cell & trophoblastic neoplasm of non-gonadal sites Gonadal sarcoma Hepatic carcinoma Hepatoblastoma Hodgkin's lymphoma Hodgkin's disease Kin carcinomas Langerhans cell histiocytosis & other histiocytosis syndromes Medulloblastoma & other PNET Melanoma Metastatic & other high risk melanomatous neoplasms Miscellaneous intracranial & intraspinal neoplasms Miscellaneous specified neoplasms Nasopharyngeal carcinoma Neuroblastoma & ganglioneuroblastoma NF1 Neurofibromatosis NF2 Neurofibromatosis Non Hodgkin's lymphoma Osteosarcoma Renal carcinoma Retinoblastoma Rhabdomyosarcoma, embryonal sarcoma & soft tissue Ewing's tumor Testicular cancer Thyroid carcinoma Wilm's tumor, mesoblastic nephroma Other leukaemia Other malignant bone tumors Other malignant gonodal tumors Other malignant neoplasms Other malignant renal tumors Other carcinoma Other glioma Other lymphomas Other reticuloendothelial neoplasms Other soft tissue sarcoma Other intracranial & intraspinal neoplasms . I am/not am am not currently receiving treatment. I have # 0 1 2 3 4 5 6 7 8 9 10 brothers and sisters. Can you tell us more about your sibling? Due to their age, are also eligible to join CanTeen. Because you’re under 18, we need to know it’s OK to contact you. My parent or guardian says it’s OK? OK Not OK for CanTeen to contact me. Oops. You’ll need permission from a parent or guardian. Please come back to this form when you’re ready. Thanks . Is there anything else you’d like to tell us about yourself? For example, if you have any visual impairments or medical implants? Please let us know how we can get in touch with you. My email address is . My phone number (including area code) is , and my postal address is, . Method Phone Email Text message Letter . Who can we contact in case of an emergency? The young persons emergency contact is their , whose name is . Their email address is email , and phone number (including area code) is . Who can we contact for in case of emergency? 's emergency contact is my , whose name is . Their email address is email , and phone number (including area code) is . Thanks . You’re all done, we’ll be in touch soon! In the meantime, why not check out some stories from Canteeners, or learn more about how we can help. What’s your family relationship with cancer? I have/lost have lost a brother or sister with cancer. Do you have other brothers or sisters? Can you tell us more about your other sibling? We’re sorry for your loss. Please tell us a little about them. My sibling, , was diagnosed with Type of cancer Acute lymphocytic leukaemia Acute myeloid leukaemia Acute non-lymphocytic leukaemia Adenocarcinoma Adrenocortical carcinoma Aggressive fibromatosis Aplastic Anaemia Astrocytoma Bowel cancer Brain Tumor Burkitts lymphoma Carcinoma of breast Carcinoma of gastro-intestinal tract Carcinoma of genitourinary tract Carcinoma of trachea, bronchus and lung Carcinoma of myeloid leukaemia Ependymoma Ewings Sarcoma Fibromatous neoplasms Fibrosarcoma, neurofibresarcoma or other fibromatous Germ cell & trophoblastic neoplasm of gonads Germ cell & trophoblastic neoplasm of non-gonadal sites Gonadal sarcoma Hepatic carcinoma Hepatoblastoma Hodgkin's lymphoma Hodgkin's disease Kin carcinomas Langerhans cell histiocytosis & other histiocytosis syndromes Medulloblastoma & other PNET Melanoma Metastatic & other high risk melanomatous neoplasms Miscellaneous intracranial & intraspinal neoplasms Miscellaneous specified neoplasms Nasopharyngeal carcinoma Neuroblastoma & ganglioneuroblastoma NF1 Neurofibromatosis NF2 Neurofibromatosis Non Hodgkin's lymphoma Osteosarcoma Renal carcinoma Retinoblastoma Rhabdomyosarcoma, embryonal sarcoma & soft tissue Ewing's tumor Testicular cancer Thyroid carcinoma Wilm's tumor, mesoblastic nephroma Other leukaemia Other malignant bone tumors Other malignant gonodal tumors Other malignant neoplasms Other malignant renal tumors Other carcinoma Other glioma Other lymphomas Other reticuloendothelial neoplasms Other soft tissue sarcoma Other intracranial & intraspinal neoplasms . They passed away in Month January February March April May June July August September October November December of Year 2017 2016 2015 2014 2013 2012 2011 2010 2009 2008 2007 2006 2005 2004 2003 2002 2001 2000 1999 1998 1997 1996 1995 1994 1993 1992 1991 1990 1989 1988 1987 1986 1985 1984 1983 1982 1981 1980 1979 1978 1977 1976 1975 1974 1973 1972 1971 1970 1969 1968 1967 1966 1965 1964 1963 1962 1961 1960 . Tell us about your sibling living with, or who survived cancer. was diagnosed with Type of cancer Acute lymphocytic leukaemia Acute myeloid leukaemia Acute non-lymphocytic leukaemia Adenocarcinoma Adrenocortical carcinoma Aggressive fibromatosis Aplastic Anaemia Astrocytoma Bowel cancer Brain Tumor Burkitts lymphoma Carcinoma of breast Carcinoma of gastro-intestinal tract Carcinoma of genitourinary tract Carcinoma of trachea, bronchus and lung Carcinoma of myeloid leukaemia Ependymoma Ewings Sarcoma Fibromatous neoplasms Fibrosarcoma, neurofibresarcoma or other fibromatous Germ cell & trophoblastic neoplasm of gonads Germ cell & trophoblastic neoplasm of non-gonadal sites Gonadal sarcoma Hepatic carcinoma Hepatoblastoma Hodgkin's lymphoma Hodgkin's disease Kin carcinomas Langerhans cell histiocytosis & other histiocytosis syndromes Medulloblastoma & other PNET Melanoma Metastatic & other high risk melanomatous neoplasms Miscellaneous intracranial & intraspinal neoplasms Miscellaneous specified neoplasms Nasopharyngeal carcinoma Neuroblastoma & ganglioneuroblastoma NF1 Neurofibromatosis NF2 Neurofibromatosis Non Hodgkin's lymphoma Osteosarcoma Renal carcinoma Retinoblastoma Rhabdomyosarcoma, embryonal sarcoma & soft tissue Ewing's tumor Testicular cancer Thyroid carcinoma Wilm's tumor, mesoblastic nephroma Other leukaemia Other malignant bone tumors Other malignant gonodal tumors Other malignant neoplasms Other malignant renal tumors Other carcinoma Other glioma Other lymphomas Other reticuloendothelial neoplasms Other soft tissue sarcoma Other intracranial & intraspinal neoplasms . They are/aren't are aren't currently receiving treatment. I have/lost have lost a parent or guardian with cancer. , was diagnosed with Type of cancer Acute lymphocytic leukaemia Acute myeloid leukaemia Acute non-lymphocytic leukaemia Adenocarcinoma Adrenocortical carcinoma Aggressive fibromatosis Aplastic Anaemia Astrocytoma Bowel cancer Brain Tumor Burkitts lymphoma Carcinoma of breast Carcinoma of gastro-intestinal tract Carcinoma of genitourinary tract Carcinoma of trachea, bronchus and lung Carcinoma of myeloid leukaemia Ependymoma Ewings Sarcoma Fibromatous neoplasms Fibrosarcoma, neurofibresarcoma or other fibromatous Germ cell & trophoblastic neoplasm of gonads Germ cell & trophoblastic neoplasm of non-gonadal sites Gonadal sarcoma Hepatic carcinoma Hepatoblastoma Hodgkin's lymphoma Hodgkin's disease Kin carcinomas Langerhans cell histiocytosis & other histiocytosis syndromes Medulloblastoma & other PNET Melanoma Metastatic & other high risk melanomatous neoplasms Miscellaneous intracranial & intraspinal neoplasms Miscellaneous specified neoplasms Nasopharyngeal carcinoma Neuroblastoma & ganglioneuroblastoma NF1 Neurofibromatosis NF2 Neurofibromatosis Non Hodgkin's lymphoma Osteosarcoma Renal carcinoma Retinoblastoma Rhabdomyosarcoma, embryonal sarcoma & soft tissue Ewing's tumor Testicular cancer Thyroid carcinoma Wilm's tumor, mesoblastic nephroma Other leukaemia Other malignant bone tumors Other malignant gonodal tumors Other malignant neoplasms Other malignant renal tumors Other carcinoma Other glioma Other lymphomas Other reticuloendothelial neoplasms Other soft tissue sarcoma Other intracranial & intraspinal neoplasms . They passed away in Month January February March April May June July August September October November December of Year 2017 2016 2015 2014 2013 2012 2011 2010 2009 2008 2007 2006 2005 2004 2003 2002 2001 2000 1999 1998 1997 1996 1995 1994 1993 1992 1991 1990 1989 1988 1987 1986 1985 1984 1983 1982 1981 1980 1979 1978 1977 1976 1975 1974 1973 1972 1971 1970 1969 1968 1967 1966 1965 1964 1963 1962 1961 1960 . Tell us about your parent living with, or who survived cancer. My mother/father mother father caregiver , was diagnosed with Type of cancer Acute lymphocytic leukaemia Acute myeloid leukaemia Acute non-lymphocytic leukaemia Adenocarcinoma Adrenocortical carcinoma Aggressive fibromatosis Aplastic Anaemia Astrocytoma Bowel cancer Brain Tumor Burkitts lymphoma Carcinoma of breast Carcinoma of gastro-intestinal tract Carcinoma of genitourinary tract Carcinoma of trachea, bronchus and lung Carcinoma of myeloid leukaemia Ependymoma Ewings Sarcoma Fibromatous neoplasms Fibrosarcoma, neurofibresarcoma or other fibromatous Germ cell & trophoblastic neoplasm of gonads Germ cell & trophoblastic neoplasm of non-gonadal sites Gonadal sarcoma Hepatic carcinoma Hepatoblastoma Hodgkin's lymphoma Hodgkin's disease Kin carcinomas Langerhans cell histiocytosis & other histiocytosis syndromes Medulloblastoma & other PNET Melanoma Metastatic & other high risk melanomatous neoplasms Miscellaneous intracranial & intraspinal neoplasms Miscellaneous specified neoplasms Nasopharyngeal carcinoma Neuroblastoma & ganglioneuroblastoma NF1 Neurofibromatosis NF2 Neurofibromatosis Non Hodgkin's lymphoma Osteosarcoma Renal carcinoma Retinoblastoma Rhabdomyosarcoma, embryonal sarcoma & soft tissue Ewing's tumor Testicular cancer Thyroid carcinoma Wilm's tumor, mesoblastic nephroma Other leukaemia Other malignant bone tumors Other malignant gonodal tumors Other malignant neoplasms Other malignant renal tumors Other carcinoma Other glioma Other lymphomas Other reticuloendothelial neoplasms Other soft tissue sarcoma Other intracranial & intraspinal neoplasms . Nice to meet you . Who would you like to refer to CanTeen? I’d like to refer . Where does live in New Zealand? 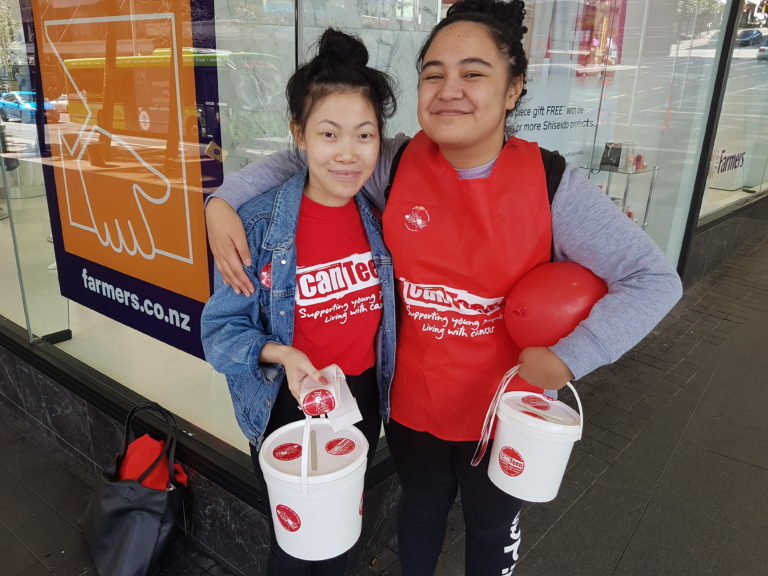 Their nearest CanTeen branch is Branch Northland Auckland Hamilton East Cape Rotorua Tauranga Manawatu Taranaki Hawkes Bay Wellington Nelson/Marlborough Canterbury/West Coast Dunedin Southland . What is 's current situation? is currently Working/Studying Working Studying Other . Their NHI number (if you know it) is . Tell us about 's diagnosis. diagnosed with Type of cancer Acute lymphocytic leukaemia Acute myeloid leukaemia Acute non-lymphocytic leukaemia Adenocarcinoma Adrenocortical carcinoma Aggressive fibromatosis Aplastic Anaemia Astrocytoma Bowel cancer Brain Tumor Burkitts lymphoma Carcinoma of breast Carcinoma of gastro-intestinal tract Carcinoma of genitourinary tract Carcinoma of trachea, bronchus and lung Carcinoma of myeloid leukaemia Ependymoma Ewings Sarcoma Fibromatous neoplasms Fibrosarcoma, neurofibresarcoma or other fibromatous Germ cell & trophoblastic neoplasm of gonads Germ cell & trophoblastic neoplasm of non-gonadal sites Gonadal sarcoma Hepatic carcinoma Hepatoblastoma Hodgkin's lymphoma Hodgkin's disease Kin carcinomas Langerhans cell histiocytosis & other histiocytosis syndromes Medulloblastoma & other PNET Melanoma Metastatic & other high risk melanomatous neoplasms Miscellaneous intracranial & intraspinal neoplasms Miscellaneous specified neoplasms Nasopharyngeal carcinoma Neuroblastoma & ganglioneuroblastoma NF1 Neurofibromatosis NF2 Neurofibromatosis Non Hodgkin's lymphoma Osteosarcoma Renal carcinoma Retinoblastoma Rhabdomyosarcoma, embryonal sarcoma & soft tissue Ewing's tumor Testicular cancer Thyroid carcinoma Wilm's tumor, mesoblastic nephroma Other leukaemia Other malignant bone tumors Other malignant gonodal tumors Other malignant neoplasms Other malignant renal tumors Other carcinoma Other glioma Other lymphomas Other reticuloendothelial neoplasms Other soft tissue sarcoma Other intracranial & intraspinal neoplasms . They are/not are are not currently receiving treatment. Does have brothers or sisters? has # 0 1 2 3 4 5 6 7 8 9 10 brothers and sisters. Can you tell us more about 's sibling (please fill in as much as you can)? Because is under 18, we need to know it’s OK to contact them. 's parents or guardian says it’s OK? OK Not OK for CanTeen to contact them. Thanks . Is there anything else you’d like to tell us about ? For example, if you have any visual impairments or medical implants? Please let us know how we can contact . 's email address is . Their phone number (including area code) is , and their postal address is . How would prefer to be contacted? Looking to sign yourself or someone else up to CanTeen? If you’ve got the time, we’ve got something meaningful to fill it with. Volunteer with us and you’ll get to make a massive difference, and have fun while you’re at it. Basically, we need you to help keep things running – whether that’s helping with fundraising support, office admin, camp helpers or nurse. If that sounds like something you’d be up for, get in touch. We’ll let you know if there’s anything you can do in your community.